Infintech is a payment processor that allows you to accept payment on your website from all major credit cards. This guide will cover installation, setup. enabling recurring payments and collection. Please note: Infintech is only available for USA-based operators. Infintech will only work if you enable SSL when setting up your Operate Portal. Go to Operate > Settings > Integrations > Payment Processors. Find Infintech and click Install. Once installed, the buttons you will see next to Infintech will be Open and Uninstall. Click Open to proceed. Next, configure the organizations for which you want to enable Infintech. Simply click Configure next to the Organization to get started. Next, add your Currency Code, enter the Login ID, Secure Transaction Key, AGI Password and Merchant ID. You need to retrieve these details from your Infintech account. Open a new tab on your browser and login to paymentsgateway.net with your credentials from Infintech and click on Gateway Settings in the left hand menu. 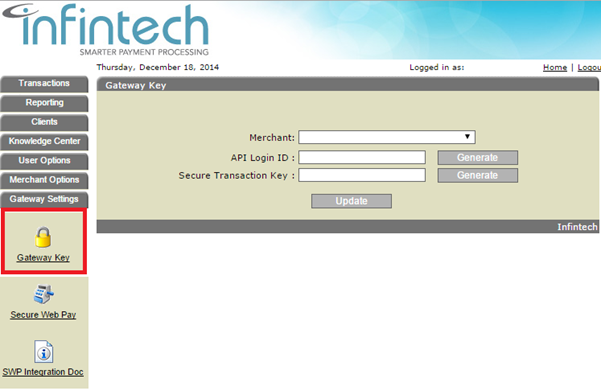 Click on the Generate buttons next to API Login ID and Secure Transaction Key and then click on Update. then copy the generated codes in the corresponding Operate fields. The AGI Password is optional if you do not want to enable recurring payments. Otherwise, you will need to populate this as well. Infintech should provide it when your account is activated. You may want to test your integration first - for this, please tick 'Use Sandbox'. 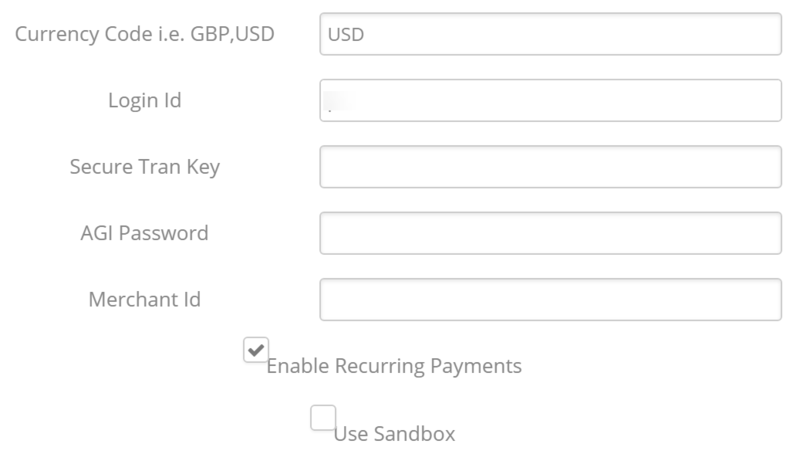 You should have a sandbox available in your Infintech account, which you can use to make test payments. Don't forget to select Save when ready. As soon as you complete the setup, Infintech should be listed as the active payment gateway for the organization(s) you have selected. 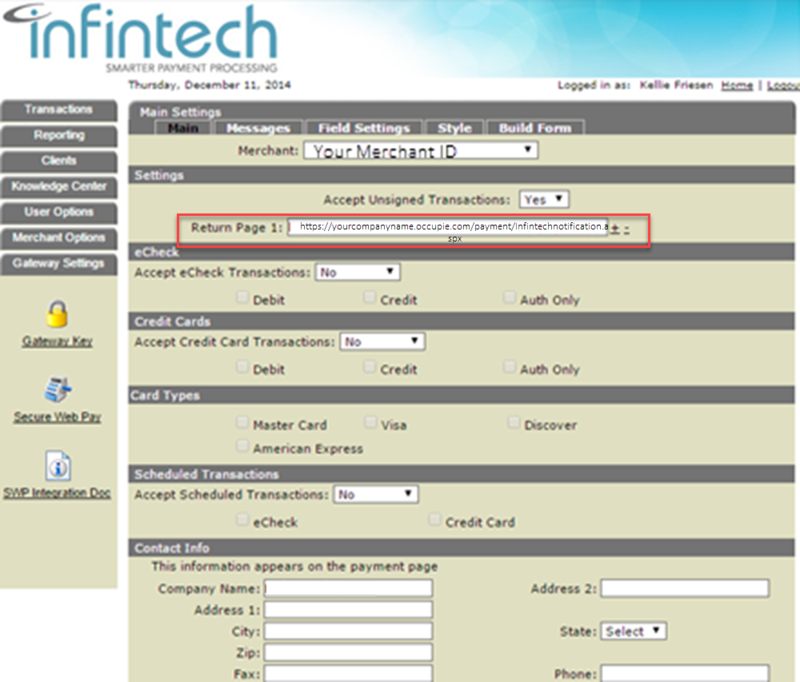 In addition to the Operate specific configuration, there is one more step you need to take in your Infintech account. You will need to set up a Return URL to display to your customers when they submit a payment. Click on Secure Web Pay and in the Settings section, fill in the ‘Return Page 1’ field with: https://yourcompanyname.member.site/payment/InfintechAuthNotification.aspx or yourvanityurl/payment/InfintechAuthNotification.aspx . Before you can use recurring payments and start the collection, the customer's card details have to be stored by making a first payment in the portal and enabling recurring payments. Recurring payments can only be selected when paying an invoice on the Portal, under My Account > Invoices. Therefore, in order for one of your customers to be able to enable recurring payments on their Portal Accounts, they need to have a balance and an unpaid invoice listed. They can enable recurring payments when paying for this first invoice. They will not be able to enable this under their Payment Settings section, which only allows them to add a Credit Card. Once recurring payments are enabled after paying an invoice, it can be cancelled from under the Payment Settings section. You will now be able to also collect payments from your customers via Infintech. by going to Settings > Integrations > Infintech. On the screen listing your organizations, simply click Start Collection in the upper right. Filter your list by Organizations or Locations as needed; and select the Accounts that you want to collect from. Click Collect Now to proceed. Your collection log download should start automatically and a copy will also be emailed to you. If you would like to download a copy of the log file click the download button below. See here for more information about Recurring Collections in Operate.